People love Google Docs because of its simplicity. It allows you to create documents or spreadsheets in the cloud and it is very easy to collaborate The Google Docs Drawing Tool Makes Collaborative Drawing Easier The Google Docs Drawing Tool Makes Collaborative Drawing Easier Read More with others. Add in the fact that it’s free and everyone can use it for document creation and sharing. With Google Docs, there never seems to be a shortage of new features either. In the past we’ve written about new real-time collaboration features, the ability to upload and share files 5 New Google Docs Features You Might Have Missed 5 New Google Docs Features You Might Have Missed Read More , and even how to sync your Google Docs to multiple machines Sync Your Google Docs To Multiple Machines With Insync Sync Your Google Docs To Multiple Machines With Insync Read More . Today, however, I’d like to talk about Google’s latest feature to their Google Docs suite: the ability to drag and drop images. In this article, I’ll explain how it works and show you what it looks like. The short answer to this question is “probably”. If you are using the latest versions of Google Chrome, Mozilla Firefox and Safari, you can begin using this feature right away. If you are using a different browser – like IE – don’t worry, because Google says they plan to support other browsers soon. Anyone who is familiar with MUO knows that we are not shy about adding images in with our articles. People love images, and they can help to supplement your written content, especially if you’re trying to show somebody how to do something. Google Docs already has three different ways for you to add images to your documents. You can upload them from your hard-drive, via URL, or you can find them using the Google Image Search. 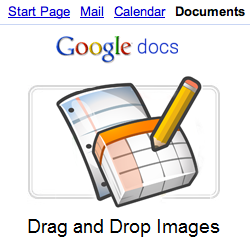 Now, however, you can simply drag the image you want from your desktop onto your Google document. It really is that easy. What do you think of this new feature? How much time is this going to save you? great addition to the feature list, Google Docs is getting better and better.